Beachgoers hoping to stretch their legs on southern California’s famous Seal Beach were surprised to find a mountain of trash instead of sand and surf this week. 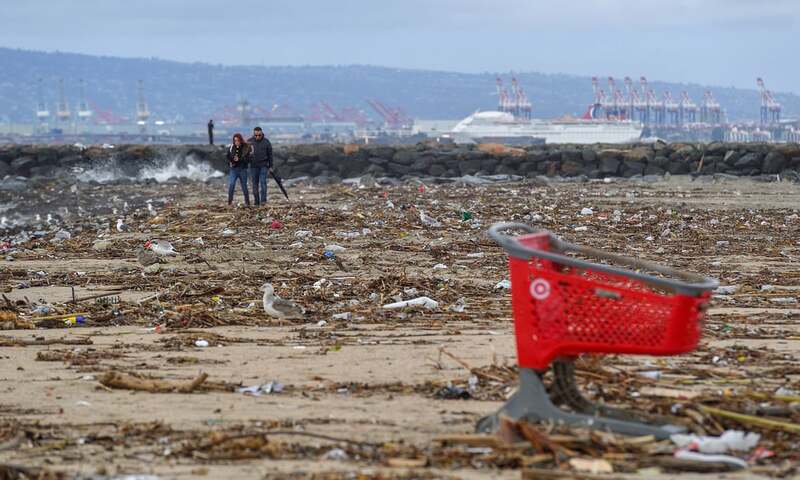 After a trio of winter storms dropped inches of rain on the area, the beach looked more like a landfill than a pristine paradise. Shopping carts, traffic cones and Styrofoam were among the piles of debris that littered the stretch of beach. Schwartz says that during coastal cleanup days, the coastal commission finds that about 80% of the trash that enters the ocean in California actually starts on land. “We have an effective transportation system for trash: our creeks, rivers and storm water systems, all of which eventually empty out into the ocean through one process or another,” he said. Tina Treude, the director of the marine center at UCLA’s Institute of the Environment and Sustainability, says that California is far ahead of most places when it comes to political actions like banning single-use plastic bags statewide. But it’s far from enough. Biodegradable plastic bags, too, make their way into the ocean, and Treude is skeptical about their ability to break down. When she and a student buried typical plastic polyethylene plastic bags and biodegradable plastic bags in sediment in their lab in 2016, they didn’t see any change in either set of bags after 100 days. Biodegradable plastic bags may break down in landfills where the temperatures get high, but the natural conditions in the ocean don’t appear to help degrade the plastic microbially, she explained. “It’s something we need to consider: whatever we put into the ocean may stay there for a long time,” she said.